Recently we have been encouraged to introduce more fireworks into our gardens and big bold plantings of tropical-looking plants are beginning to appear in all our gardens. But creating an exotic look does not necessarily mean brassy cannas or flamboyant datura that require mollycoddling. There are lots of smaller plants, many of them hardy, than can hint at glamour and mystery whilst sitting comfortably in a more traditional planting scheme. 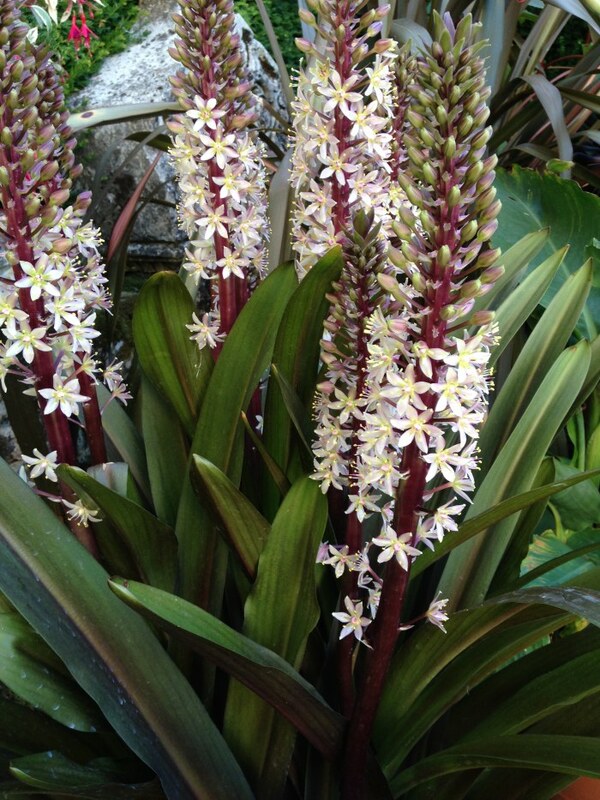 The pineapple lily, Eucomis, is one such plant. A bulb from South Africa it has, as its common name suggests, a flower that resembles a pineapple fruit on the end of a thick stem, surrounded by elegant strap-like leaves. Most easily found in nurseries and garden centres is Eucomis bicolour, with green foliage and flowers, but new varieties have been introduced in the past few years. 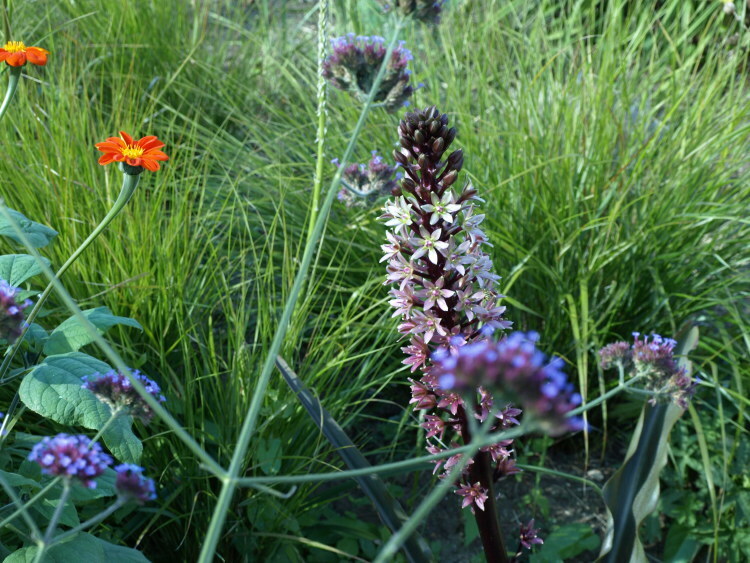 Eucomis ‘Zeal Bronze’ has green foliage burnished with a purple lustre that makes it an attractive plant to grow even before it flowers. In midsummer a thick burgundy-colour stem appears and the dark buds slowly open along its length into polished maroon star-like flowers. The flower spike is topped with a cluster of leaves that could have been designed by Bart Simpson’s hairdresser. Lasting about six weeks, the flowers start to dry-out in the autumn, leaving very attractive seed-heads. This long performance – from eye-catching new shoots, through striking flowers to beautiful seed heads – makes this plant a true hard worker in the garden. Unusually for such a Carmen Miranda of a plant, Eucomis ‘Zeal Bronze’ is hardy on dry soils. Plant the bulb just below the surface in rich well-drained soil and it will quickly clump-up. When really happy it will seed itself around but the seedlings tend to be green. Grow it in full sun to bring out the best in its colouring. If you have cold wet clay, try them in large pots or lift the bulbs, dry them out and store them in the garage during the winter.